Nothing says class, sophistication, and refined taste than this little glass bottle created over 90 years ago. Timeless in its beauty, its integrity, its Parisian style, and its uncompromised quality. After all these years, CHANEL No. 5 is not only still one of the best selling perfumes in the world, but it still represents everything complex, elegant, chic, and powerful of a woman with unwavering beauty and intelligence. Just like the classic CHANEL jacket, this fragrance is a symbol of a real woman; a woman who knows who she is, where she’s going, and exactly how to get there. Created in 1921, Coco Chanel wanted a fragrance that smelled like a woman! A scent, just like the complexities of a strong woman, that would be seen as a whole and not the sum of its parts. CHANEL No. 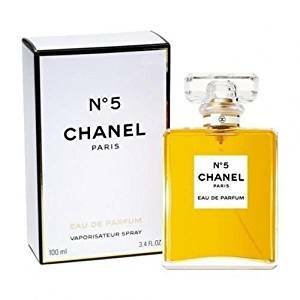 5 is a composition of notes where one cannot easily distinguish its individual ingredients, instead smelling a bouquet of intricate and elaborate notes that intermingle like a mosaic of scent. Not only is this perfume unique in its composition, but it was also one of the first fragrances to use synthetic notes called Aldehydes. This move should not be taken as a choice for lower quality, instead, synthetic notes are often used for their unique expressions and their subtle combined effects versus using strong notes of actual flowers and plants. Generally, Aldehydes, like in fragrances like CHANEL No. 5, give the fragrance that ambiguous floral-citrus-soapy scent. Besides the obvious aldehydic quality of CHANEL No. 5, it is difficult to describe the scent. It is something unique unto itself and is almost impossible to distinguish separate notes. Not only that, but the complexity and vastness of notes used, make CHANEL No. 5 quite an enigma and for the most distinguished and appreciative noses. Along with the floral-citrus-soapy Aldehydes, CHANEL No. 5 is marked with bursts of zingy Bergamot and Lemon that pierce through the other top notes of intoxicating Ylang Ylang and delicate Neroli. The effervescent top notes almost coming completely lost in the heady floral bouquet of Rose, Jasmine, and Lily-of-the-Valley; not to mention the thick powdery Iris and Orris Root. But the base notes are where this fragrance flourishes.